Rumor: The California Department of Public Health has issued a warning against measles parties. Claim: The California Department of Public Health has issued a warning against measles parties. 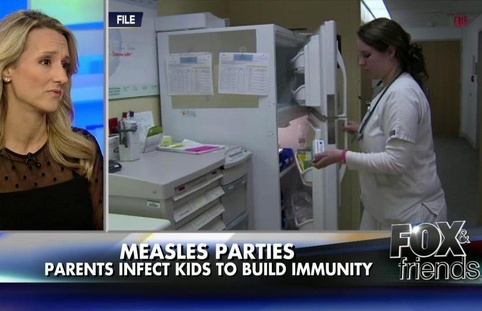 Due to a lack of actual problems, California parents consider measles parties to create some problems for themselves. In a 2015 measles outbreak traced to Disneyland, more than 100 people contracted that illness across at least 17 states and reignited a long-running debate over the value of MMR (measles, mumps, rubella) vaccinations. Public commentary concerning the outbreak became increasingly polarized, and the rumor about measles parties in California fueled debate over parental responsibility and public health. California’s Department of Public Health released a statement saying it does not recommend intentionally exposing kids to measles. In the meantime, the CDC reports there are over 100 cases in 14 states, 39 of them were infected at Disneyland. All claims were chronologically similar: parents in California began hosting measles parties after the outbreak began, and in response to that circumstance California’s Department of Public Health was forced to issue a public health warning to parents advising against this foolish “new trend.” Although that seemed plausible to many readers, a few initial inconsistencies were present. While measles and chicken pox were both at one time common childhood illnesses, a vaccine for the latter virus is a fairly recent development. As such, measles was rarer in recent decades than chicken pox, and measles eradication was declared in the U.S. in 2000. Only 103 people to date have contracted measles in California in the 2015 outbreak, hardly a number sufficient for measles parties to be a real trend of any description. By contrast, entire communities of children contracted chicken pox in recent memory, and infected youngsters were not uncommon in the not-too-distant past. We searched for any public health bulletins from the California Department of Public Health matching the news claims but found none. The agency subsequently confirmed to us that no measles party warning had been issued by them prior to news coverage of the purported trend. Further, a California health official explained to us before the rumor circulated, a news outlet called to inquire whether the department had received any reports about measles parties. When a representative stated no such reports had been received, the reporter asked about the agency’s position on measles parties and was (predictably) told public health officials advised against them. It’s important to note the subsequent comment came in response to a reporter’s question about what the agency advised if measles parties were a real trend, not because they were a real trend. Furthermore, the news story was frequently framed as reporting on an advisory released by the Department of Public Health, when in fact news outlets contacted that agency about a putative public health phenomenon and then proceeded to ask the agency’s hypothetical position on that largely non-existent phenomenon. CDPH RESPONSE: The California Department of Public Health (CDPH) does not have any information to share about the background or frequency of pox parties. But CDPH strongly recommends against the intentional exposure of children to measles, as it unnecessarily places the exposed children at potentially grave risk and could contribute to further spread of the outbreak. Measles is a serious illness that can have significant consequences. Thirty percent of people with measles in the current California outbreak have been hospitalized.